Former Keeneland sales marketing associate Chauncey Morris, now CEO of Aushorse, is promoting the Australian Thoroughbred to the world and with great success. Racing Victoria posted a Youtube video of Morris, who recently returned to Australia from a promotional stint abroad, talking about the global high regard of the Australian racehorse and several other topics ranging from sales to artificial insemination. “Things are very exciting,” Morris says of the Australian Thoroughbred. Morris joined Thoroughbred Breeders Australia, which is the national body for the nation's breeders, and Aushorse Marketing as CEO in December 2011. Vin Cox, managing director of Australian sales company Magic Millions, credits Morris with attracting a number of high-profile buyers to the record-smashing National broodmare sale May 28-30 on Australia’s Gold Coast. Active buyers included Kentucky-based Hill ‘n’ Dale Farms and Stonestreet Thoroughbred Holdings, evidence of an emerging trend of U.S. investment in Australian bloodstock. Morris joined Keeneland in 2002 and helped establish a global sales strategy for the sales company as well as initiatives to attract news owners to the sport. 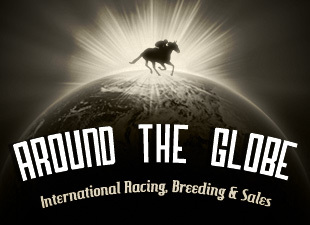 He also established a global emerging markets program within the Kentucky Thoroughbred Association/Kentucky Thoroughbred Owners and Breeders. Prior to joining Keeneland, Morris was as a trade specialist for the Kentucky Department of Agriculture from 1999-2001, when he was appointed as an analyst and adviser to then-Gov. Paul Patton's Office of Agricultural Policy. Morris now resides in Sydney with his family.